The February meeting was held at Jack Putnam's garage near Bluffton. Since Bob Torbet was out of the country, Bob Hollister led the meeting with 16 members in attendance. Dave Benny reported that we had $268.57 in the treasury as of January 1, 2002. Everyone is reminded that dues are to be given to Dave. Melvin Gierhart presented his materials to the group about the Ohio Jamboree and asked for any further information from the other members. Jack and Jim are still developing the routes for the tours. Bob and Dave are seeking donations and sponsors. It was decided to place the safety checklist on the back of the registration sheet for the tour. 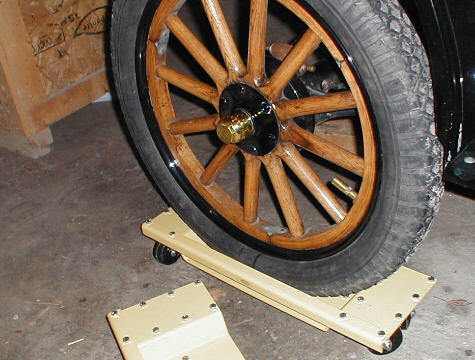 This will be our proof that the participants have been given the information that is needed to ensure the safety of their Model T. Also, an offer has been made to have a slide show presentation at the awards banquet on Model T's in Australia. Some of the members have seen a similar presentation in the past and say that it is very much worthwhile. Melvin Gierhart has a 1927 roadster and matching covered trailer for sale. It is an older restoration, but is ready for the tour. It has many additions. 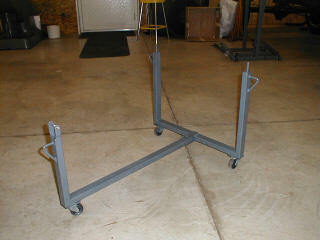 Melvin is asking $11,500.00 as a set. Call at (937) 497-0457. 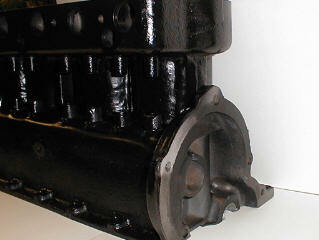 1916 Engine. Fully rebuilt/restored. Has been test run. 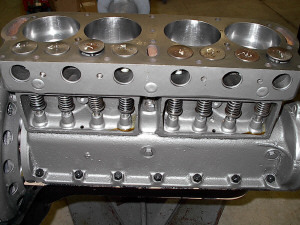 Low head, narrow nose pan, over size valves, weight matched rods, all new babbitt, aluminum pistons .060. Ready to drop in and drive. Very quiet running T engine. 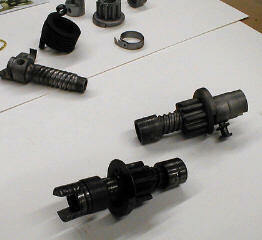 transmitted through the bendix spring and into the starter drive sleeve. These are the two parts that are most often broken. The bendix spring is replaced by removing the starter drive bolts from the starter drive head and the starter drive sleeve. 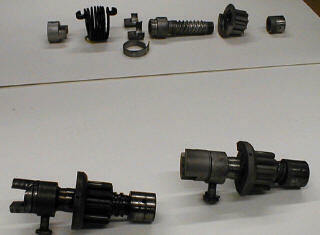 Individual parts of the subassembly can be bought for roughly $10 a piece. With the price of a brand new starter drive set at around $60, it may be easier to just buy a new one. You be the judge. 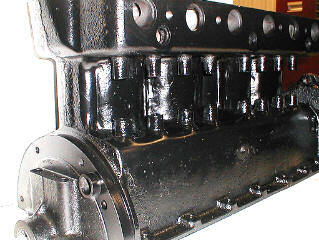 This open valve engine block for the 1910 is in the process of being rebuilt/restored. A little customization work was needed to get the engine into running order. 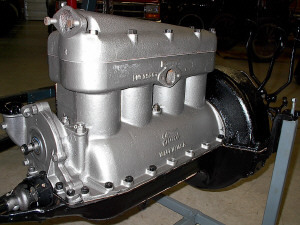 This project has brought back the old issue of what to do with an old worn out engine. Is it better to scrap it or is it best to put a few thousand dollars into reviving it? I, for one will be delighted to see this project come to completion. It should be a winning class Model T.
Colorado/Wyoming Model T Tour - June 8th - 14th 2002. Keystone Cops Regional Tour - August 14th - 18th 2002. All Ohio Model T Jamboree - August 30th - September 1st 2002. With all of the liability problems that are possible when you get 100 Model T's together for a tour, we have been looking at ways to ensure that the T's participating the Ohio Model T Jamboree will be safe by the standards of both the MTFCA and the MTFCI. Inspection can be time consuming and labor intensive. For these reasons, we've decided to print the Model T Safety Checklist on the back of the registration form. All cars must have a signed checklist in order to participate in the tour. As always, if someone has a project that they are working on and would like the club to help out, bring it up at the meeting for the members to discuss. There is a great amount of knowledge in the group. Every one of us can make a difference in the group. We might even decide to have the next meeting in your garage for a little hands-on-experience. Anyone that would like to write an article for the newsletter or present a project at one of our meetings is welcome to contact one of the officers. We'd be glad to have the help. Thanks!! !